プリヴェ企業再生グループ 株式会社｜Privee Turnaround Group Co., Ltd.
日中平和友好条約締結40周年記念・清華大学藝術博物館 絹谷幸二展作品解説Koji Kinutani Exhibition Tsinghua University Art Museum Commemorating the 40th Anniversary of the Conclusion of the Treaty of Peace and Friendship between Japan and China. Koji Kinutani was born in the ancient capital of Japan, Nara. Being a highly historical and religious city, Kinutani was surrounded by an artistically rich environment since childhood. As he grew older, he naturally aspired to become a painter. He built his foundations as an artist at the Oil Painting department at the Tokyo National University of Fine Arts. Kinutani's oil paintings during his university years were distinctively monochromatic and chaotic in structure. Shortly later, he encountered with classical fresco paintings. With the recommendation by his teacher, Bruno Saetti, Kinutani entered the Academy of Fine Arts of Venice to master the classical fresco technique. Kinutani's time in Italy transformed his painting style entirely. Through copying fresco paintings countless times as part of his training, Kinutani learnt the importance of the contour line, and achieved a lighter and a more flat expression. The signature Kinutani-style of the rhythmic "line" and vibrant colors was born. After returning to Japan, he rose to fame with his innovative fresco painting style. His unique style of overflowing the canvas with texts had a major influence on younger generation of painters who grew up in the manga and animation culture. During this period, Kinutani grew out of his early painting style which made full use of the classical fresco technique and was characteristic of vibrant colors and rhythmical lines. The contour line, which was one of the largest features of his early style, disappeared from his paintings. Instead, the "Pointillism expression" and his "Sand Series" were born. Eventually, Kinutani leaned towards cubism. Kinutani's art scaled up from 2D (paintings) to 3D when relief-style works and three-dimensional sculptures made of styroform were created. Many of the works which were created during this time addressed the modern chaotic social climate, and cried out for world peace. From the 2000's, Kinutani challenged various themes, and his artistic developments reached full maturity. Motifs that represent Japan or Asia ― such as Mt. Fuji and the rising sun, fantastic images inspired by Japanese myths and legends, dragons, Acalanantha (a fierce Buddhist deity), Wind God and Thunder God, and the Seven Gods of Good Fortune ― filled the canvas. These rich images, full of life, suggested the infinite possibilities of mankind's imagination and creativity. The Buddhist teaching of "Mujo-kan (a view of life as something transient and empty)" and "Funihomon (dharma-gate of non-duality)" underlines the powerful art world of Kinutani. With a strong belief that "Art has a power stronger than any weapon," Kinutani continues to call for world peace and trust in humanity through his creations. Koji Kinutani was born near the Kofuku-ji temple in Nara, the ancient capital of Japan. 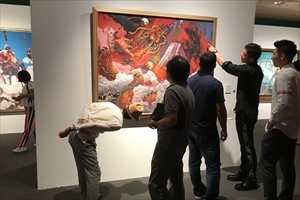 Aspiring to become a painter, he studied at the Oil Painting Department at the Tokyo National University of Fine Art and Music, and graduated from the university's graduate school. 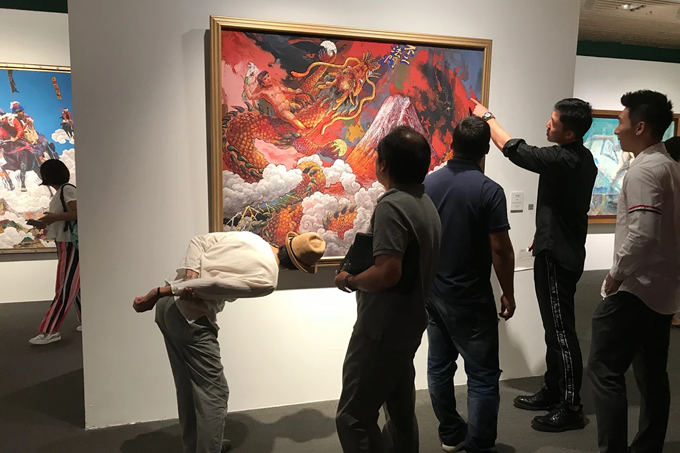 In 1980, shortly after the Japan-China Peace and Friendship Treaty was concluded, Kinutani made his first trip to China and traveled from Beijing, Xi'an to Dunhuang. 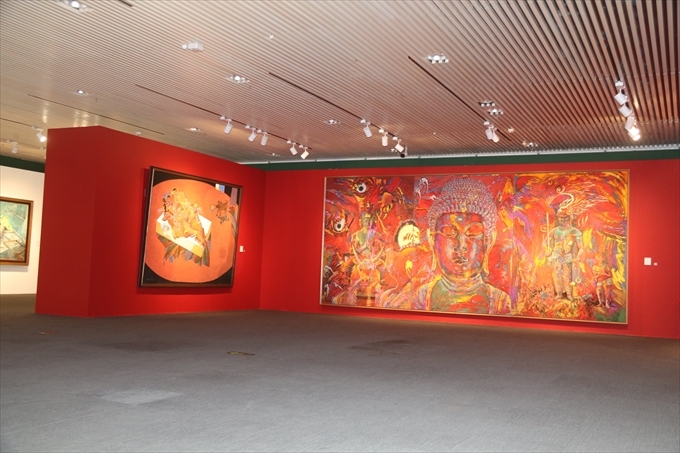 In 1986, he traveled to Shaolin Temple to create mural paintings on the walls of the temple. In 1993, he held special lectures on "Environmental Art" for one month at the Central Academy of Fine Arts in Beijing as part of a cultural dispatch program of the Japan Foundation. 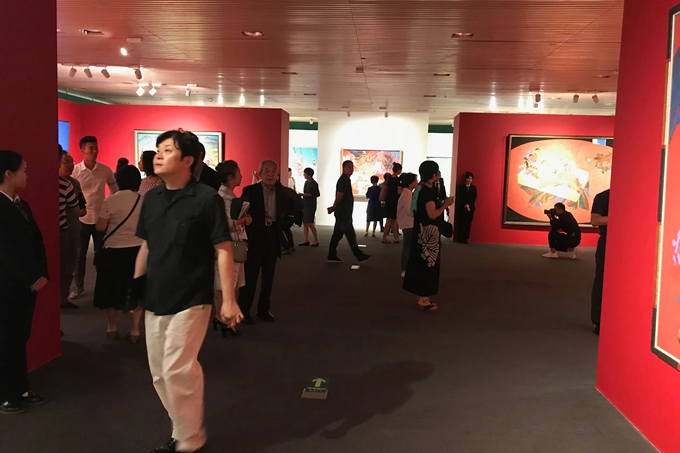 In the same year, the "Japan-China Contemporary Oil Painting Exhibition" was held at the National Art Museum of China, exhibiting works by Chinese artists and Kinutani's students from the Tokyo National University of Fine Arts. In 1997, Kinutani was commissioned to design the official poster for the Olympic & Paralympic Winter Games in Nagano and individual posters for seven different sports, including his work, "Ginrei no Megami (Goddess of the Silvery Peak)." 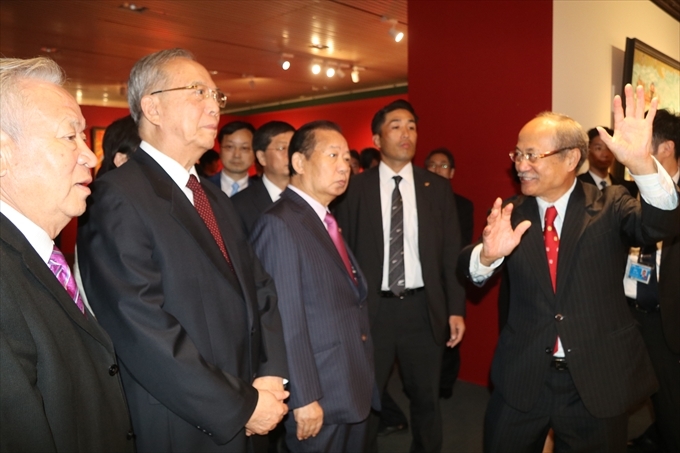 In the same year, he visited China with Dan Ikuma as a member of the Japan Cultural Exchange Association delegation. 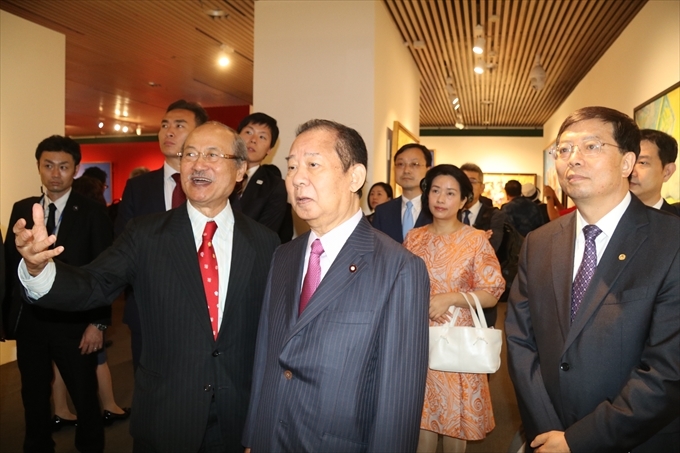 In 2006, as head of the Japanese delegation of the 1st Expo Central China held in Changsha, Hunan Province, Kinutani led a thousand people from Japan to China. 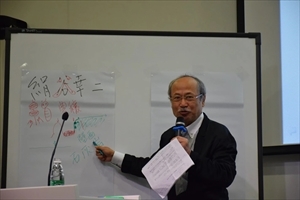 In 2008, as a Special Advisory Board of the Tourism Agency in Beijing, he held the "Symposium for Attracting Tourists" and participated as a panelist at the "Gathering for Japan, Kansai and Nara" in Shanghai. 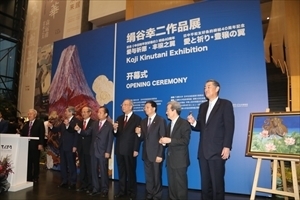 In the same year, Kinutani met with President Hu Jintao in Nara, and succeeded in conducting the cultural project to take the statue of Ganjin Wajo of Nara Todai-ji temple back to its home country, China. In 2010, he was appointed as the director of the Japan Cultural Exchange Association. 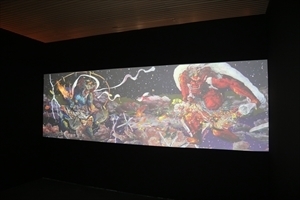 In the same year, he produced an LED ceiling painting "Flying Surya and Chandra" for the Japan Industry Pavilion at the Shanghai World Exposition. 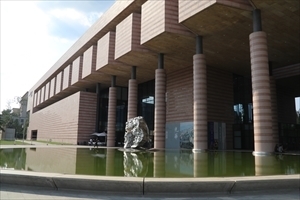 In 2011, he was invited as a guest artist for the Chengdu Biennale. 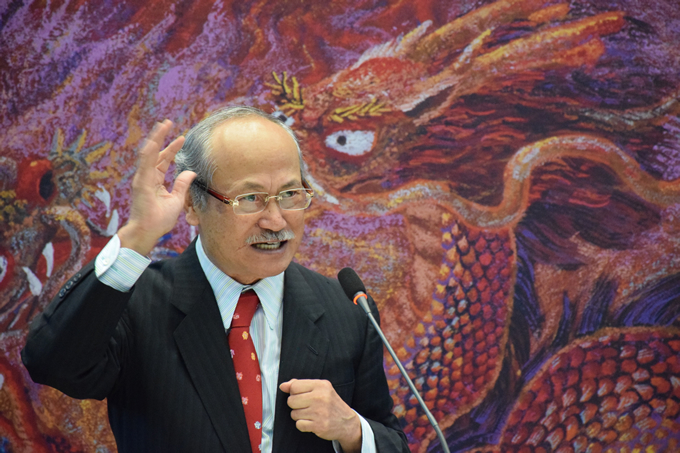 Since 2000, Kinutani has accompanied Toshihiro Nikai of the Liberal Democratic Party of Japan on a grand mission to lead the Japanese delegation of 5000, 13000, and 25000 people to China. 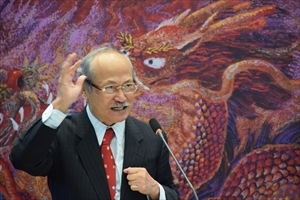 In 2014, Kinutani was accredited as Person of Cultural Merit. In 2015, he received the 66th NHK Broadcasting Culture Award (by the Japan Broadcasting Corporation). In the same year, he served as head of the "Japan-China Tourism Cultural Exchange Group" of 3,000 people. 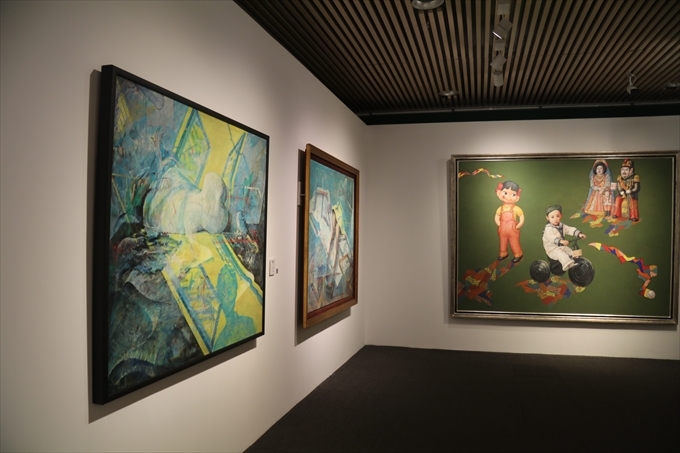 In 2017, the exhibition, "Koji Kinutani, A Journey of Color and Imagery" was held at the National Museum of Modern Art, Kyoto. 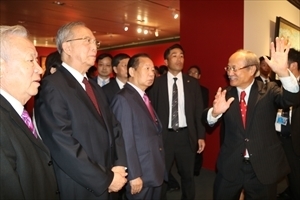 In the same year, he traveled to China as a member of the Ruling Party Economic delegation and met with President Xi Jinping of the People's Republic of China, President Li Xiaolin of the Chinese People's Association for Friendship with Foreign Countries, and President Qiu Yong of Tsinghua University. 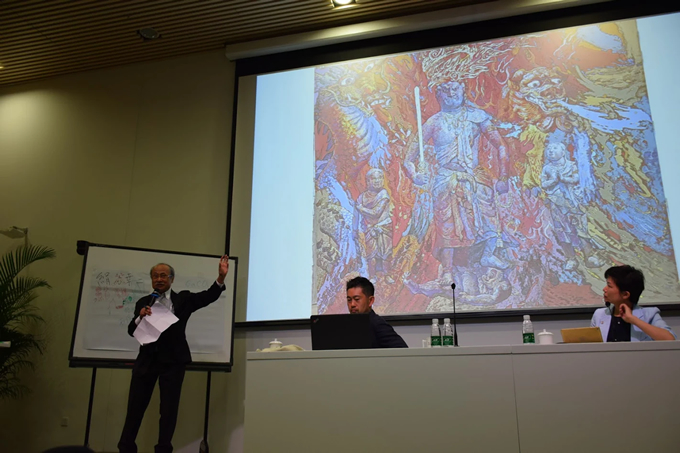 Kinutani is currently a professor emeritus of the Tokyo National University of the Arts and Music, a member of the Japan Art Academy and the Independent Society of Fine Art, and an Honorary Director of the Koji Kinutani Tenku Art Museum. 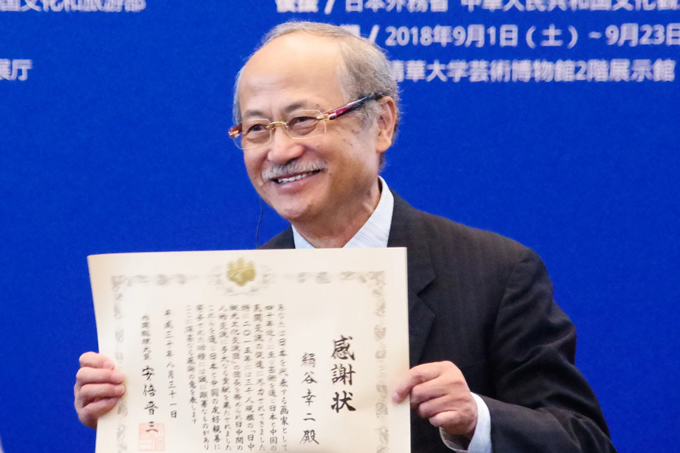 As the director of the Japan-China Cultural Exchange Association, Kinutani continues his mission to promote mutual exchange between Japan and China. Although painters usually develop their style gradually, there are some who succeed, when the time is ripe, in suddenly establishing a world of their own. Among them is Koji Kinutani, who won the prestigious Yasui Prize at a young age. With the prizewinning work Portrait of Mr. Anselmo (1973), which employs the technique of fresco strappo (removing the paint layer of a wall fresco and applying it to another support), he embarked on a long journey that continues to this day, in which he makes unique and passionately expressive use of a classical medium. The 1973 work represents a spontaneous creative leap, and at the same time it is of monumental significance as a consolidation of his technical, chromatic, and graphic explorations carried out in Italy. The emergence of dynamic forms with a strong sense of velocity, surrounded by contour lines resembling strokes of lightning, the vivid palette with red as a base tone, the somehow mythological imagery that is both overflowing with energy and imbued with a sense of collapse and destruction. Such depiction of objects and scenes is closely connected to the metaphysical painting of Giorgio de Chirico. Kinutani's distinctive, humorous Pop sensibility is full of mystery and wonder. These unique qualities have essentially remained in Kinutani's work until recently, although they have grown in scale over the years until they seem to encompass an entire universe. 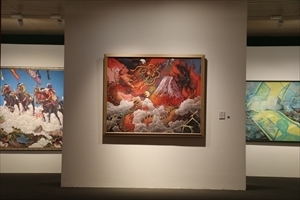 This retrospective is subtitled A Journey of Color and Imagery, perhaps reflecting the artist's recognition that he has trod a single path since ascertaining his own artistic qualities with his receipt of the Yasui Prize, although it has been an exceedingly diverse and fertile one. Incidentally, the Mr. Anselmo of the painting was a painter with whom Kinutani was close friends when he was studying abroad in Italy, and although he was gaining some recognition as an artist, he for some reason gave up painting and went to India, where he disappeared. His face in the painting is so deconstructed that it can hardly be called a portrait, and Kinutani has written that his brush may have foreseen Anselmo's fate. Depending on one's viewpoint, the coexistence of generative and disintegrative forces in a single painting could indicate that Kinutani's work is imbued with the ambiguity of love and death, despair and salvation. Kinutani's world may fascinate us because of the artist's depth of thought, the way he peers into the shadows lurking behind the brilliant, vital scenes he depicts. NELLA SABBIA(in the Sand)(1982), for example, depicts a man and a woman lying entwined in an embrace in a coffin-like box lying amid the red desert sands. Objects resembling shells are lying around them, indicating that this may be battlefield. Hiragana are written on the inside of the box, and the kanji mu (nothing) and fragments of the Heart Sutra are inscribed on the sand. We cannot read any story directly, but the painting quietly conveys the artist's prayers that love will conquer in a world constantly wracked by wars springing from intolerance. Non Dimenticare (Do not Forget)(1994) is anomalous among Kinutani's works for its dark, somber tones(although red and blue are partially used), and the large canvas presents a vista of destruction, massacre, ruins and other horrors of war. The words pika don (an onomatopoetic representation of the atomic bomb's light and sound) are written near the bottom. Despite, or perhaps because of, the fact that the artist's works are often viewed with an aesthetic and sensual eye, the work delivers a message that could only be delivered through brushwork. In this sense, Kinutani's paintings have an affinity with religious art and the philosophy attending it, no matter how contemporary and "Pop" a sensibility they may present. Another notable point is that Kinutani's exploration of painting techniques like fresco strappo later led to his three-dimensional Styrofoam works in the late 1980s. A work such as Open Pandora's Box (1990) displays characteristics evident since the era of Portrait of Mr. Anselmo, such as fragmented images, saturated color, inclusion of text, and elements of construction and destruction, and is even more powerfully chaotic. Indeed, it is just like opening Pandora's box. At the end of 2016, the Koji Kinutani Tenku Art Museum opened in Umeda, Osaka. 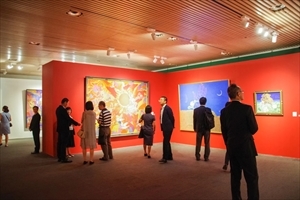 It is located on a high floor of a building overlooking the city of Osaka, and primarily features new and recent works. What fascinates me the most is the screening of 3D images. Through state-of-the-art technology, viewers can be immersed in a world of imagery such as Mount Fuji and the Wind and Thunder Gods, with mythological narrative and galactic scale, where paintings featuring fluid, dynamically linked images such as only this artist could create are boldly enlarged. Kinutani has succeeded in a challenging, and thus thrilling experiment in incorporating painting into video. I look forward to seeing these new experiments with the moving image, as well as the overview of the arc of Kinutani's great, long and diverse journey that this exhibition offers. 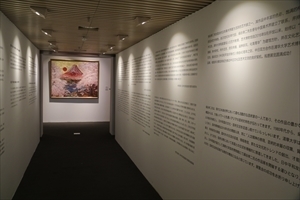 It is an absolute honor for me to hold the Koji Kinutani Exhibition at the Tsinghua University Art Museum in Beijing, China, to commemorate the 40th anniversary of the conclusion of the Treaty of Peace and Friendship between Japan and China. 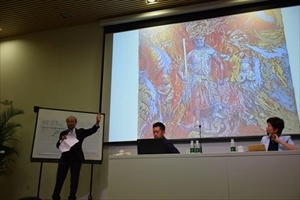 In 1993, I had the pleasure to teach fresco painting at the China Central Academy of Fine Arts for one month as part of Japan Foundation's cultural exchange program. In 2000, with Mr. Toshihiro Nikai, I participated in the 1st Expo Central China held in Changsha, Hunan province. As the leader of the Japanese delegation, I led a thousand people to China. Since then, I took three thousand, five thousand, and ten thousand Japanese tourists to China and continued to support the Japan-China tourism exchange. On another note, I was born near the Toshodai-ji temple in Nara prefecture which was founded by the Chinese priest, Ganjin. The exchange between Japan and China has been ongoing for many thousands of years. I believe that I must keep this great river of cultural interaction flowing and help the diverse culture of Asia to flourish. We are all within the "Lotus Road" which Mr. Toshihiro Nikai promotes. I would be more than pleased if I am able to help enhance spiritual interaction through art, and spread the wings of abundance. 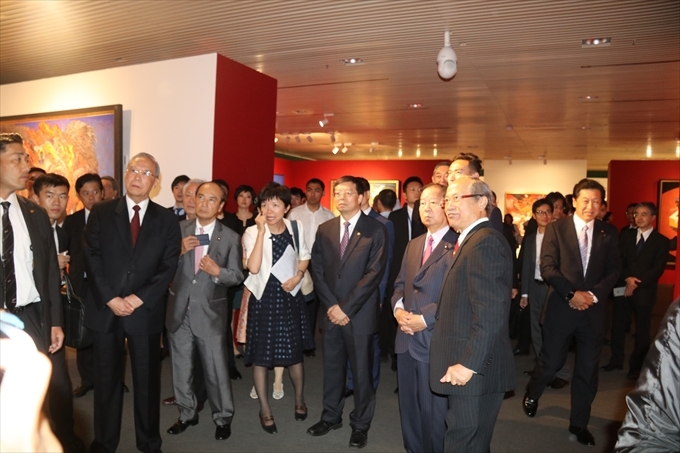 I would like to express my deepest gratitude to the Chinese government, Tsinghua University Art Museum, Mr. Nikai and members of the Shisuikai, Japan-China Exchange Promotion Committee, and to all those who have offered their kind support to make this exhibition possible. Japan and China are irreplaceable partners who have established a close and reciprocal relationship through many years of exchanges. As globalization rapidly progresses, it is extremely important, not only for Asia but also for the development and prosperity of the world, to promote mutual understanding and trust between the people of both nations. 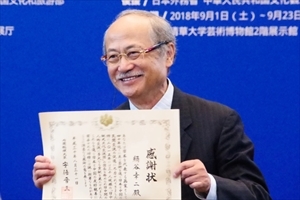 Celebrating the 45th anniversary of the normalization of diplomatic relations between Japan and China in 2017, and the 40th anniversary of the conclusion of the Treaty of Peace and Friendship between Japan and China in 2018, in order to further strengthen the Japan-China friendship and cooperation, we established the Japan-China Exchange Promotion Committee in Japan and have supported exchanges between the two countries in various fields such as economics, academics, culture, arts and sports. 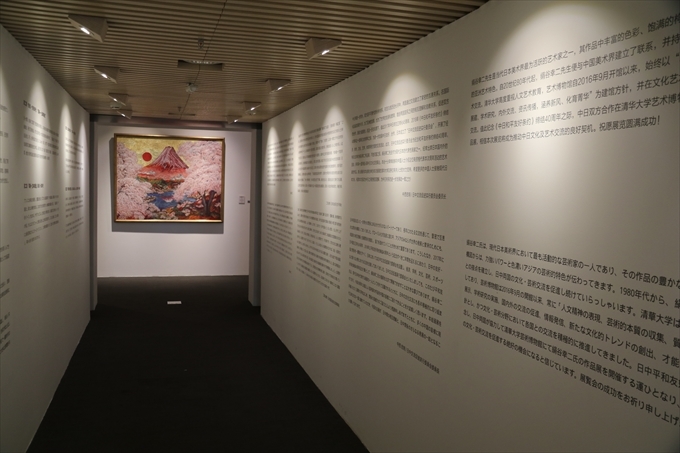 It is our great pleasure to be able to hold Mr. Koji Kinutani's solo exhibition in Beijing to commemorate the 40th anniversary of the conclusion of the Treaty of Peace and Friendship between Japan and China. Mr. Koji Kinutani is one of the leading painters of contemporary Japan who is active both at home and overseas. He has also worked passionately for many years on promoting cultural exchanges between Japan and China. We are delighted to be able to introduce such an artist to the people of China in this memorable year. Lastly, we would like to express our deepest gratitude to the Tsinghua University for co-hosting this exhibition, and to all those who have provided their kind assistance and cooperation. We hope that this event will be an opportunity for many people in China to explore one aspect of contemporary Japanese culture, and that it will help further develop the relationship between Japan and China. 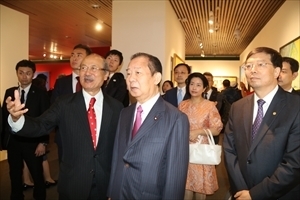 First of all, I would like to express my deepest gratitude to President Qiu Yong of Tsinghua University, Chairman Hiroaki Nakanishi of the Japan-China Exchange Promotion Committee, and to all those who were involved in China and Japan for offering their kind support for the "Koji Kinutani Solo Exhibition: Love and Prayer, the Wings of Abundance ― Commemorating the 40th Anniversary of the Japan-China Peace and Friendship Treaty" at the Tsinghua University. I am convinced that Koji Kinutani's exhibition is a highly meaningful event that would help pass on the passion and effort of our predecessors in building the friendship between Japan and China to the next generation. The development of a relationship between two countries ultimately comes down to human interaction. Therefore, it is truly important to create opportunities to for the people of both countries to experience each other's cultures. It will not be possible to develop together, politically or economically, if we do not trust or respect one another from the bottom of our hearts. Following my lecture at the Central Party School on December 28th, 2017, and my speech about China's highest leader and China-Japan relations at the Great Hall of the People, I received the title of Tsinghua University Emeritus Professor from President Qiu Yong of Tsinghua University. During the grand banquet, President Qiu Yong and I made a toast promising to organize my publication party and Mr. Kinutani's exhibition at the Tsinghua University when the beautiful lotus flowers bloom. This is how this exhibition came to be. Our country strongly agrees with Mr. Kinutani's ambition to build the future with the power of art. I too will continue to strive for this goal, and would like to express my sincere congratulations to Mr. Kinutani.